Listen up, because I’m going to be totally, 100% honest with you: Traveling in New Zealand is not cheap. Some may say it’s expensive. But don’t let that ruin your dreams of visiting this absolutely epic country. Just because it’s not as cheap as backpacking through Southeast Asia doesn’t mean you can’t travel to New Zealand on a budget. You’ll just need a bigger budget than, say, you’d need for a trip to Thailand. We’re going share some of our top money-saving tips that will help you travel on a budget in this notoriously expensive country. Then we’ll to break down the average costs of things like accommodation, food and transport so you have an idea of how much you should expect to spend while traveling in New Zealand. So what are you waiting for? Let’s talk money, honey! Now that you have an idea of how much things cost in New Zealand, let’s talk about all the ways you can save money and stay on top of your budget. This one is kind of a joke. But also serious. And how can you beat free accommodation when you’re on a tight budget? If that’s what you’re after, Couchsurfing is the way to go. You could also try WorkAway or WWOOFing if you’re interested in room and board in exchange for a bit of work. Just be aware that if a work-exchange interests you, you must obtain a working holiday visa. But for all the rest of you who aren’t keen on relying on strangers for transport and housing, keep reading, because we’re getting to the good stuff… All those practical tips that will help you save cash. Already high prices skyrocket during New Zealand’s peak tourist season, which runs from December - February. If you know your budget is tight, avoid this time frame, when crowds are thick and prices for hotels and tours reach their peaks. However, if your schedule is not flexible and peak season is the only time you can travel, know that the extra expense means you will likely have better weather during New Zealand’s summer months. Traveling New Zealand in a campervan isn’t necessarily cheap, but it gives you the opportunity to save more money than you’d be able to if you’re staying in hotels. If you’re on a tight budget, there are several budget-friendly campervan companies (we have a whole article with our top recommendations), and to compare prices we like Motorhome Republic. It does essentially what Skyscanner does for flights, and you can filter and sort your results by price as well as other factors. If your budget is looking tight, consider applying for a relocation rental. Many campervan companies need their vehicles shuttled between the North and South Islands, and YOU can be the person for the job! How it works: After being approved for a relocation rental, you will be assigned a timeline. Typically, you will have a certain amount of days to get from Christchurch to Auckland (or vice versa) set by the rental company. If you are traveling during peak season, your dates will likely not be flexible, but in other seasons, you might be able to extend a day or two (which you will need to pay for). Personal Note: You will be on a tight schedule and won’t have much downtime. One of the best things about campervaning is being able to chill in a random place for awhile. You’ll have to be okay with having a go-go-go mindset. Gas is incredibly expensive in New Zealand (our campervan averaged 21 miles per gallon during our trip in 2018), so choosing a vehicle with good gas mileage will seriously help your budget. Spacious campervans might be intriguing, but the larger the vehicle, the more likely it is to guzzle gas. Instead, choose a smaller campervan with a better MPG. Or if you’re on a super tight budget, you could rent a small car and do a mixture of tent camping and staying in hostels. Unless you stick exclusively to cheap fast food joints, eating out will no doubt make your budget skyrocket. To save money, cook the majority of your meals. Plus, this will help you eat healthier. Don’t know where to start with campervan cooking? Fear not, it’s easier (and more fun!) than it sounds. And to help you get started, we’re sharing our favorite campervan recipes that are healthy, easy, delicious and cheap! And if you’re not one for cooking and your budget is absolutely tiny, you can always opt for ramen noodle packs and peanut butter sandwiches. Groceries in New Zealand weren’t as expensive as we were expecting. For the most part, produce and other items seemed to be on par with the US (and sometimes cheaper). In most cases though, meat tended to be on the more expensive side. So when buying groceries, we went almost completely vegetarian (a few exceptions here and there). When we’re cooking in a campervan, we try to avoid meat as much as possible because it can be difficult keeping it the right temperature and cleaning up properly after handling it. Plus, you really just don’t need meat. Lucky for you, we put together our 5 go-to campervan recipes that are easy, delicious and cheap. Oh, and they are all meat-free! The Warehouse: This big box store is basically New Zealand’s version of Walmart. If you need any clothes (think extra layers! ), toiletries, linens, camping gear, or really anything else, The Warehouse is where you’ll find it for cheap. Pak’n Save: There are plenty of grocery stores around the country, but if you’re looking for the best prices, Pak’n Save is where you’ll find them. They have some of the same brands as the other stores, but sell the goods at a discounted price. If you like to enjoy adult beverages, you’ll either love or hate New Zealand. If you’re a beer-drinker, be prepared for a higher price tag (especially if it’s craft beer you’re after). Liquor is on the steeper end, too. But wine-lovers rejoice! Your beverage of choice can be found quite cheap in this country. And just because it’s cheap doesn’t mean it’s low quality wine. With an abundance of vineyards in New Zealand and Australia, you’ll have many options when it comes to vino. Free campsites are plentiful around New Zealand, and it’s in your wallet’s best interest to take advantage of them. You likely won’t stay at free sites every night unless you don’t ever want to shower (in which case, more power to you!). We tried to camp at Holiday Parks (or sites with showers) every 3-4 days, and free sites or DOC sites in between. Tip: Be sure to read up on the difference between free campsites and freedom camping. DOC campsites are a great choice because they are more affordable than Holiday Parks, and they are generally pretty nice. If you plan to stay at a lot of DOC sites, it might be a good idea to get a DOC pass. However, before you click the purchase button, make sure there are enough DOC sites on your route to make it worthwhile. And ensure they are part of the pass network. We learned the hard way when we spent the night at a DOC site and assumed the pass covered it. A ranger approached us the next morning and told us that not all DOC sites are included. So if you can’t get through your day without a cup of Joe each morning (like us! ), we would strongly suggest brewing your own. We packed a collapsible coffee filter that we use for camping, and it worked wonderfully. We also saw single serving French presses at The Warehouse for around $10 NZD. On that note, bring a reusable coffee mug into a cafe and you’ll usually get a small discount (10 to 50 cents per cup). Similarly, plastic bags incur a fee at many New Zealand supermarkets. So bringing your own reusable bag helps avoid this. The bigger reason to pack your reusables though, is to create less waste. We also travel with these eco-friendly travel items to help reduce our carbon footprint. Read more of our road trip budget tips we have complied over the years. And if you want a NZ specific packing list, you can download this 7-page PDF totally free. No catch. Just enter the best email to send it to. Okay, so you can’t drink water from every river in New Zealand. This one was just coming from a glacier so it was pretty fresh. Tap water in New Zealand is amazing and safe to drink! (The South Island has some of the best water in the world.) So please, oh pretty please, don’t buy plastic water bottles. BYOB (bring your own bottle!) and save not only money, but plastic waste. One of the greatest things about New Zealand is that all National Parks are free to enter. If you like hiking, you’ll be in heaven. And this activity is easy on your wallet! Just pack a picnic lunch and you’ve got an entire day of fun for basically nothing. Insider Tip: Check out the Breadcrumbs app for some “hidden gems” around the country. Many of these sites are free! Trust us when we say there are hundreds of fun (and fast!) ways to blow your money in New Zealand. You’ll see advertisements all around the country for bungee jumping, jet boating, skydiving, helicopter rides, whitewater rafting, and just about every other tour you can think of. New Zealand is called the “adventure capital of the world” for good reason, and if you’re into that stuff you should absolutely jump off some stuff (or something like that!) while you’re there. But plan out which activities you definitely want to do, and WHERE you want to do them. If you do this ahead of time, you won’t wind up broke when you return home. There are a few discount cards that can actually save you quite a bit of money throughout the course of your trip. SmartFuel Card: You can pick this card up for free at BP, Caltex or Countdown, and you can save up to 6 cents per gallon of gas. Top 10 Holiday Park Pass: If you plan to stay at lots of Holiday Parks along your New Zealand road trip, this pass might be worth it for you. It costs $49, but you will save 10% on each stay. Plus, there are some discounts on big activities around the country. For instance, you’ll get a 15% discount on ferry tickets between the North and South Island, which can be quite a big chunk of change. Read up on the membership benefits and discounts to see if it makes sense for you. Before any trip, we sit down and come up with a realistic budget based on the type of activities and traveling we want to do. We’ve divulged exactly how we make travel budgets, so you can create your own too! You should be able to see if you’re on track with your budget, and which categories you are overspending on so you can adjust your habits. Perhaps your “Food” category is surprisingly high after a few meals at nice restaurants. In order to even it out, you can cook all your meals for the next few days. The great thing about most budgeting apps is they work seamlessly between currencies, so you can input your expenses in New Zealand dollars but see your budget in your home currency. How much does traveling in New Zealand cost? We’re going to walk you through a few of the common expenses so you have an idea of how much to budget for your trip to New Zealand. Note: All of these prices are averages based on our experience traveling in New Zealand in November/December 2018 (just before peak tourist season). Some of these costs — like accommodation and tours — can vary depending on the season. Like most other places in the world, dorm beds are the cheapest type of accommodation. However, campervans can be a good option too. Just remember, you’ll have to pay for the campervan rental, gas and campgrounds. Read up on how to choose the best campervan for your budget. Read up on the different types of campsites and where to find them. Gas is surprisingly expensive in New Zealand. Eating out can be quite expensive, however, cooking your own meals is very affordable (and healthier!). Beer and alcohol tend to be more expensive, while wine from New Zealand and Australia can be quite cheap! Going to coffee shops every day is tempting, but it won’t break the bank if you do it every once in a while. Buying a bag of beans at the grocery store and brewing your own is a good way to save money. 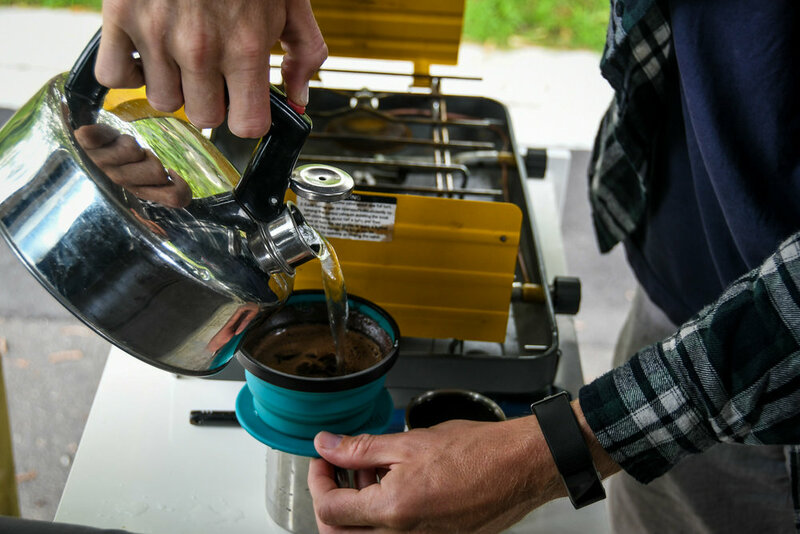 We love traveling with our collapsible coffee filter. There are plenty of opportunities to go on tours or adventure activities. However, they tend to be quite expensive, so think about which splurges are at the top of your New Zealand Bucket List. Do you have any budget tips for New Zealand? How do you plan to travel New Zealand cheaply? Which tip was best for your travel plans? We want to hear it all in the comments below. Are you heading to New Zealand soon? Save these to Pinterest!